Summer of 1989, suburban/ rural Pennsylvania aka Wyomissing….I heard for the first time words that stick with me to this day. “Pimpin’ aint easy…” no sir Mr. Big Daddy Kane it surely is not, and neither is “Bloggin'” or “Thanksgiving” player. It really is hard to keep up with… so my apologies to those millions of avid readers I have collected in the few short months I have decided to use this as an outlet! How do you segue from Big Daddy Kane into a food blog? Simple, you show a picture of something scrumptious! Thanksgiving is upon us. Who wants to break out some red wine, smash some turkey and sit like a huge load on the couch? I do, I do. Thanksgiving is hands down the best holiday ever conceived. It has morphed over the years but I am not here to provide a history lesson nor any advise on stupid Black Friday (the dumbest tradition ever). I am here to help you with some dope recipes and ideas that will make your Thanksgiving really mouthwatering. Thanksgiving is a holiday where amateurs and masters alike come to play. I am not sure why people who never cook on a regular basis think that they can execute a 22lb stuffed bird, 8 sides, homemade bread and 15 desserts. During Thanksgiving, I like to classify people into four categories. Donkeys: People who use Stove Top stuffing, gravy from a can or jar, Marie Callender’s frozen pies and some horrible green bean concoction that contains Campbell’s Mushroom soup as a base ingredient. Turkey Bosses: Sorry Mother in laws, love you mean it! We have a standing joke in our family that everyone’s mother in law likes to be the “Turkey Boss” on Thanksgiving. Meaning that when the going gets tough with that 22 lb behemoth, they like to swoop in with Chardonnay on their breath and offer ill timed advise to save the whole meal. Nothing says the holidays like too many cooks in the kitchen! I really do love you all…immensely. But go relax, we will ring the bell when dinner is ready. Learners: People that I love who are going to try cooking their first T-giving meal for their family or friends. So cute, you got a free turkey and now you are looking to entertain. Maestro: People who have mastered the art of Thanksgiving. This is where they hook up the meanest meal of the year in excess. Not one but possible 2 turkeys (one roasted, one smoked). Maybe a standing rib roast. Two or dare I say three different types or stuffing… that contain things like knockwurst and 4 or 5 different types of mushrooms. Sides, salads desserts… all executed and plated to perfection. Nothing drives me crazier than scooping dinner out of a tin foil hot tray. Just sayin! I know your like ” Nick, it is impossible to be a maestro, so just give me a recipe”. You are all in luck. I just happen to have a few delicious tricks up my sleeve that we cook every year. Here is the skinny, and please don’t ever be a Donkey your family depends on it! Turkey: Brine it. Take a look at this recipe for a good brine that has to be done 24 hours in advance. Folks, there is no way around it… BRINE THE “GD” TURKEY. I promise you will thank me for it. When you go to roast it, place aromatics underneath it such as whole carrots, onions, stalks of celery, rosemary and lemons. I am not a fan of stuffing a Turkey. It takes way longer to cook because no air is moving inside. 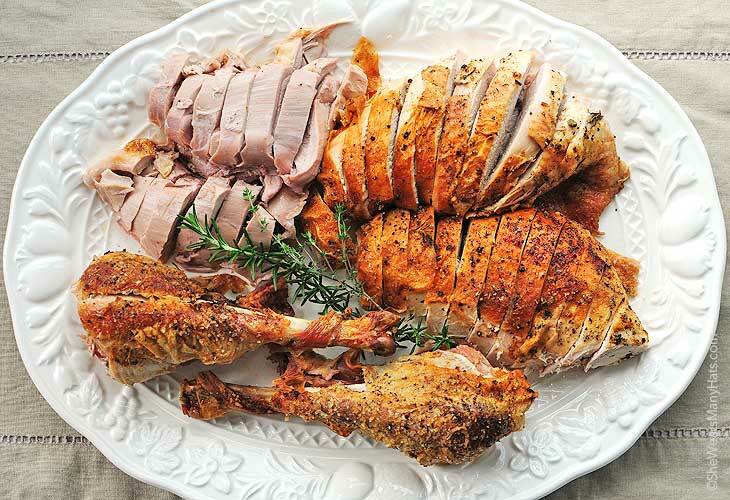 Stuff your Turkey with more aromatics and call it a day. Pancetta and Brussels Sprouts: This is one of my favorites. Fresh, crunchy a little salty and a little sweet. You can accomplish this in a couple easy steps. Step 1: Cut the sprouts in half, trimming the bottom where it gets a little brown. Throw them in boiling water for like 3-5 min., strain them and throw them directly into ice water to stop the cooking, set them aside for later. Step 2: Grab your slice of like 2 inch Pancetta, and cut it into “Lardons”, fry them in a frying pan until the are crispy and delicious. Take your time with this… as they will be a center piece to the dish. Make sure not to overcrowd the pan. Step 3: Take your Brussels Sprouts, put them in a frying pan with a little olive oil. Heat them on medium/high heat until they begin to take on a golden hue. At the last minute throw in your Pancetta just to heat it through. Do not cover this dish, do not cook it to long. Nothing is worse than when it gets soggy! Stuffing: This is a real nail biter and a point of contention among many. Wet Stuffing, dry stuffing, filling… the list goes on and on. Stuffing can be many things and can contain many ingredients. But keep one thing in mind, put in it what you like! If you like sweet sausage, put that in there. If you like knockwurst, throw a few in. If you like Thumanns Hot Dogs because of the “snap” on the casing… give it a whirl. Stuffing is nothing more than day old bread, egg as a binder and chicken stock. The rest is up to you. I got a stuffing from my brother a few years back. We make it every year and every year it is a little different… but the premise is the same. Sausage, some wursts ( usually knock or brat), loose sweet sausage of a high quality and 4 or 5 different types of mushrooms that look good. Here is a good recipe from your girl Martha… you can use this as your base and riff off of it. Cheers and Happy Thanksgiving! Enjoy your meal, enjoy one another!